The Wisdomleaf team has experience and expertise in building BlackBerry Apps from scratch and can optimize iPad and iPhone applications for BlackBerry platform. A must-have application for users travelling to France or Spain and do not know the local language. 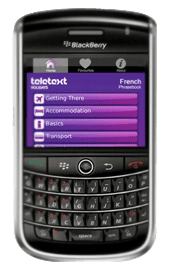 It allows users to communicate in French or Spanish by playing each phrase in French/Spanish at the touch of a button. The user can select phrases from categories which include basic concepts for daily communication like greetings, transportation related queries, etc. Play each phrase out loud at the touch of a button.